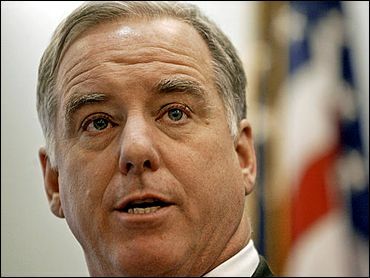 A feisty but linguistically correct Howard Dean told his DNC executive committee on Saturday that Democrats were more ethical than Republicans and that they looked more like America. He stopped short of saying Republicans hadn't worked a day in their lives and that they were a white Christian party. And while he attacked Tom DeLay for advocating excessive government interference in private family matters, he refrained from saying he should go directly to jail. The past week has been one of damage control for Dean who has been treading carefully, knowing that the gaffe police are on patrol. His advisers put him on the slow road back to the national media, sending him off to red states to talk about rebuilding state parties and test driving a new message to friendly local reporters. Then, just when they thought he had moved beyond the scream, Howard let Howard be Howard again. Establishment Democrats have been unsure that Dean was the right man for the DNC job, but he convinced them that he was all about nuts and bolts and that he had a track record of new ways of reaching voters and raising money. Dean cut a deal with congressional leaders that making policy was their province. The problem is that there is a link between raising money and policy, and the motivation for small donors who invest their $25 in politics has a lot to do with issues and causes. Dean burst onto the national scene in 2003 as the voice of anti-establishment Democrats on the Iraq war. In the speech that catapulted him to national prominence he blasted Democratic leaders "supporting the president's unilateral attack on Iraq" and claimed that he represented the Democratic wing of the Democratic Party. He rocked the hall with those words, his presidential campaign took on huge momentum and his Internet money started to flow. Dean's colorful language has caused him trouble, but a case can be made that his silence has created more trouble. Specifically, his virtual silence on the Iraq war since he has become DNC chair, despite polls saying a majority of Americans now believe the war was not worth it and 60 percent believe it's time to bring the troops home. The grizzly statistics that almost 1,700 American troops and another 85 U.S. private contractors have been killed seem more compelling than Dean's new focus on ethics in government, pensions and ramping up state parties. Out of 190 press releases on the DNC's web site, only three mention Iraq and then only in the context of other issues. Dean's speech on Saturday urging Democrats to put a moral component into their politics was devoid of any rhetoric about the morality of the Iraq war, something that originally endeared him to the Democratic base. And none of his fundraising appeals so far have emphasized the war. The surprising thing is not that big-money Democrats have been holding back but that the DNC's small-donor direct mail and online money has been coming in more slowly than expected. Former DNC Chair Terry McAuliffe predicted that the committee was on a track to raise $100 million this year; estimates now are that they will raise only half that. In his defense, Dean counters that raising a million dollars a week ain't bad. Dean's folks say it takes time to build a program and that their pitch that money is needed to build 50 state parties is turning on the spigot. Last week, one of Dean's more effective fundraising gimmicks during the presidential campaign started to work again. The gaffe attacks raised him $100,000 online, just like the attacks from his opponents did during the primaries. The day he was elected chair of the DNC, Dean skipped over Iraq in his speech and when asked about it later said merely that his views hadn't changed, though he declined to restate them. "Most of the policy pronouncements are going to be coming from the leadership of Congress, not from me," he said. Dean's compromise when he took over the DNC was to let the Democratic officials who he once maligned determine policy. But one wonders how much more credible he would be on the issue of morality and how much more effective he would be in motivating his base if he resumed a leadership role on the war in Iraq.